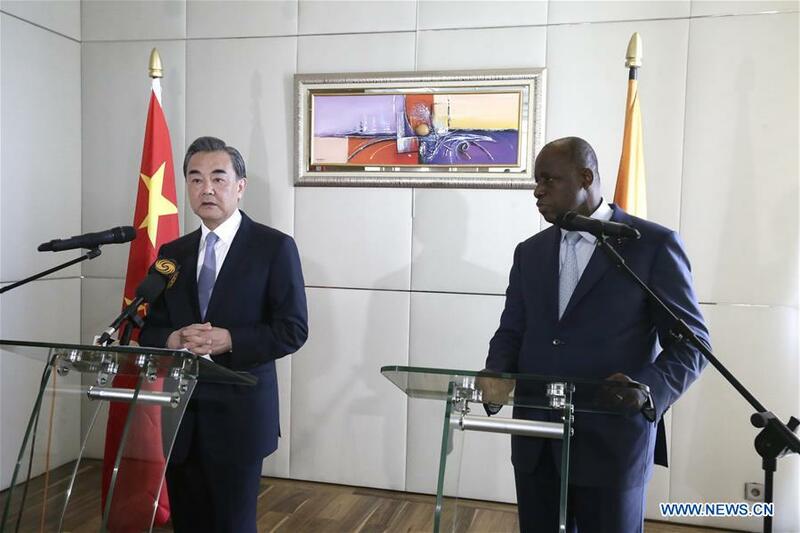 ABIDJAN, May 23 (Xinhua) -- China is willing to strengthen cooperation with African countries within the framework of the Belt and Road Initiative, visiting Chinese Foreign Minister Wang Yi said here on Monday. Speaking at a press conference, Wang said his current visit to four African countries comes right after the Belt and Road Forum for International Cooperation was successfully held in Beijing. The four countries, i.e. Mauritania, Cape Verde, Mali and Cote d'Ivoire, have all expressed willingness to participate in China's Belt and Road Initiative. "We can combine the 10 major China-Africa cooperation plans proposed by President Xi with the Belt and Road Initiative," and make them complement each other, Wang proposed. The African countries believe that China is their most ideal and reliable cooperation partner and is willing to benefit from the fast development of China's economy, Wang said. Wang recalled the long history of China-Africa friendship, saying that friendship has been bearing rich fruits. In Mauritania, the port that China helped building in the 1980s is still actively functioning today and supporting Mauritania's economic development. It is called "the port of friendship". The once famous "Triangle of Poverty" in southern Mauritania has now become the "Triangle of Hope", thanks to the new roads and infrastructure China helped building. "The other day, the foreign minister of Cape Verde told me that, 23 years ago, his wife was having a difficult labor," Wang said, "At that critical moment, it was Chinese doctors who saved the lives of his wife and child. His whole family is grateful until this day." "Stories like this can be heard everywhere in Africa," Wang added,"They make up part of the foundation of China-Africa friendship." In recent years, China has also been increasing investment on Africa's peace and security issues, Wang said. Currently there are over 2,000 Chinese soldiers in Africa carrying out U.N. peacekeeping missions, contributing greatly to Africa's peace and security. Wang paid official visits to Mauritania, Cape Verde, Mali and Cote d'Ivoire on May 19-23.